Dengue fever is a mosquito-borne viral disease caused by one of four antigenically distinct dengue flaviviruses: dengue virus 1 (DEN-1), dengue virus 2 (DEN-2), dengue virus 3 (DEN-3), and dengue virus 4 (DEN-4). The Aedes aegypti mosquito transmits the virus while ingesting a blood meal. Primary viral infection occurs with any of the four serotypes. Dengue hemmorhagic fever (DHF) is a more severe form of dengue fever associated with thrombocytopenia and hemoconcentration. A patient can be infected by at least two, if not all four types (ie, DEN-1, DEN-2, DEN-3, DEN-4), at different times, and the infection can reoccur once during a person’s lifetime. See the distribution map below. 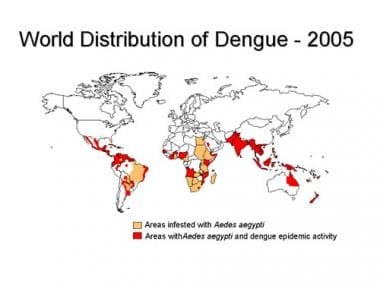 Worldwide distribution of dengue in 2005. Picture from the Centers for Disease Control and Prevention (CDC) Web site. Viral infection may lead to acute illness with fever and 2 or more of the following symptoms: headache, retro-orbital pain, myalgia, arthralgia, rash, and hemorrhagic manifestations. In 2004, dengue fever resulted in a case of permanent bilateral visual loss. The vision complication was a result of retinal capillary occlusion. Fever and other symptoms may subside after 3-4 days, and the patient may recover completely, or the fever may return with a rash within 1-3 days. Dengue, frequently called breakbone fever, is endemic to large areas of the tropics and subtropics, including the Caribbean Islands. Dengue is a public health concern because most of the population in tropical America is susceptible to infection. A serosurvey conducted after the first confirmed dengue outbreak in Peru in 1990 demonstrated that an earlier outbreak of dengue transmission had been undetected. The silent transmission of dengue was demonstrated in 1992 in an area of Taiwan that was believed to be free of the disease. Recent outbreaks of dengue in nearby Caribbean, Central American, and South American countries increase the likelihood of future autochthonous transmission among people in Florida and Southeastern states. Cases of dengue fever reported in Texas and Israel occurred from travelers who were infected with dengue while visiting other countries. The risk of autochthonous transmission increased when they returned home. Dengue fever has become more prevalent because of increased travel into regions where dengue is common. In 2000, 674 million travelers boarded ships and airline for international travel. In 2012, more than one billion people were recorded to have traveled internationally. Go to Dengue and Severe Dengue Infection for complete information on these topics. Dengue fever is a mosquito-borne viral disease caused by 1 of 4 antigenically distinct dengue flaviviruses: DEN-1, DEN-2, DEN-3, and DEN-4. Dengue is transmitted to humans through the bite of infected A aegypti mosquitoes. Persons with dengue flaviviruses in their blood can transmit the flaviviruses to the mosquito (the vector) 1 day before the onset of the febrile period. The patient can remain infectious for the next 6-7 days. After an A aegypti mosquito ingests the flavivirus from an infected human during a blood meal, the flavivirus replicates for 8-12 days. After the incubation phase, the mosquito remains infectious for life. The flavivirus multiplies in the gut of the mosquito and attains a high titer in its salivary glands. The mosquito transmits the flavivirus when a fresh human host is bitten. The virus does not adversely affect the mosquito. The life span of A aegypti, the primary vector of dengue in the Americas, is usually 21 days. The life span of A aegypti and the incubation period depend on the temperature and rainfall in the region. An animal reservoir is not necessary to maintain the cycle of transmission of dengue fever, but an animal reservoir in the form of monkeys appears to exist in limited areas of Africa. In the continental United States, dengue occurs only in the season when mosquitoes breed actively (warm weather). Since the 1970s, outbreaks of dengue fever, dengue hemorrhagic fever (DHF), and dengue shock syndrome (DSS) have increased in frequency and severity in the Caribbean and the Americas. In the past 2 years, an increasing number of reports of dengue fever have occurred in the United States, particularly from travelers to areas indigenous to the disease. A aegypti and Aedes albopictus, a recently introduced vector species, have been found throughout Florida. A aegypti breeds year-round in southern Florida. The last dengue epidemic in Florida (in the Tampa and Miami areas) occurred in 1934-1935 and affected an estimated 15,000 people among the population of 135,000 in Miami. The last recorded epidemic in the southeastern United States occurred in Louisiana in 1945. Outbreaks of dengue also occurred in Laredo, Texas in 1998. Approximately 40% of the world's population (2.5 billion people) resides in regions in which dengue is endemic, and dengue is endemic in 112 countries in the world. Annually, 100 million cases of dengue fever and 500,000 cases of DHF are reported worldwide. The reported 500,000 cases of DHF in 2004 is a tremendous increase from the 2002 data. This should prompt further concern as to the seriousness of the epidemic. Dengue and other arboviruses (ie, arthropod-borne viruses) have attracted a good deal of attention because of an increasingly mobile population that progressively impinges on jungle terrain. According to the surveillance data, almost 200,000 cases of dengue fever occur yearly in 31 countries in Central America and South America. The rate among disease-endemic populations may be as high as 6400 cases per 100,000 persons exposed to mosquito bites. Data on the rate of dengue among travelers are scarce. Since the 1970s, outbreaks of dengue fever, DHF, and DSS have increased in frequency and severity in the Caribbean. People of all ages are affected. Compared with younger individuals, elderly persons are more likely to be at risk because of coexisting medical concerns. Of patients with DHF, 90% are younger than 15 years. With early diagnosis and supportive care, fatalities are rare. Convalescence is slow. Aspirin and NSAIDs are discouraged owing to potential platelet dysfunction causing bleeding. Children who receive aspirin are at risk of developing Reyes syndrome; therefore, they should never receive aspirin when Dengue fever is suspected. The mortality rate of DSS is reported to be 2%. Exposure to a serotype besides the 4 mentioned can lead to DHF or DSS, which have serious complications and may be fatal. DSS can occur after DHF, with symptoms of circulatory and respiratory failure that may result in death. Rare complications include depression, pneumonia, iritis, orchitis, and oophoritis. Secondary reinfection is unlikely because of preexisting antibodies. Patients have a history of recent travel to a region where dengue is endemic. Symptoms begin with a sudden onset of high fever (temperature >101°F), chills, and a severe (termed breakbone) aching of the head, back, and extremities. DHF begins with a sudden elevation in temperature as seen in dengue fever. Of patients with DHF, 90% are younger than 15 years. Current studies show that T cells that are reactive to the dengue fever virus may be contributors to the development of DHF. The fever persists for 2-7 days and defervescence is followed by the development of hemorrhagic symptoms such as bleeding from sites of trauma, gastrointestinal bleeding, and hematuria. Patients may also present with abdominal pain, vomiting, febrile seizures (in children), and a decreased level of consciousness. Diarrhea rarely is a symptom in patients with dengue fever. Sore throat, prostration, and depression are accompanied by conjunctival redness and flushing or blotching of the skin. The initial febrile phase lasts 3-4 days followed by a remission of a few hours to a few days. Skin eruptions appear in 80% of patients during the remission of the fever. Approximately one half of patients develop a centrifugal macular, maculopapular, scarlatiniform, or petechial eruption. [2, 6, 7] The cutaneous eruptions may become confluent, with small, round islands of sparing, the so-called white islands in a sea of red. The rash characteristically starts on the dorsum of the hands and feet and spreads to the arms, legs, and torso; the face is rarely involved. The eruption seen in dengue lasts 2 hours to several days. Before it appears, distinguishing dengue from malaria, yellow fever, or influenza is difficult. The tourniquet test can be performed by inflating a blood pressure cuff for 5 minutes. The development of 3 or more petechiae per square centimeter indicates a positive finding. Positive results are present in more than 50% of cases. Laboratory testing is essential for diagnosis. Laboratory tests usually reveal characteristic thrombocytopenia, leukopenia, and pathologic values of aspartate aminotransferase and alanine aminotransferase. Leukopenia is characteristic of dengue fever. Serum samples obtained during the acute stage and during convalescence should be sent to the laboratory for immunoglobulin M antibody–capture enzyme-linked immunosorbent assay (MAC-ELISA). MAC-ELISA is used for disease monitoring. Positive results should be reported to public health authorities. Medical care is entirely symptomatic. Symptomatic treatment is usually effective. The death rate for untreated DHF/DSS can be as high as 10-15% in places where emergency supportive treatment with intravenous fluids and platelet replacement is not readily accessible. Analgesics, fluid replacement, and bed rest are usually sufficient. Permit the patient to gradually resume their previous activities, especially during the long period of convalescence. Local and state health authorities should be alerted about new cases of dengue fever. Alert health care providers about the occurrence. Outbreaks of dengue will increasingly cross common borders of endemic and disease-free countries unless (1) health surveillance is increased, (2) new cases are promptly reported, (3) professional awareness is heightened, and (4) public education is provided. Encourage participation in mosquito-abatement activities. Examples include insecticide fogging, the elimination of mosquito-breeding sites, the disposal of refuse and old tires, covering water receptacles, and changing water in birdbaths daily. Encourage patients to use personal protection such as skin repellants and mosquito screens, and advise them to avoid mosquito-breeding sites. An experimental vaccine is being developed. New vaccines for different dengue serotypes are available, but they are difficult to obtain. Recombinant DNA technology has contributed to the potential development of novel live-attenuated vaccines against dengue viruses  ; however, because of adaptability and a short generation time of dengue viruses, developing an effective vaccine will continue to be a challenge. Siqueira RC, Vitral NP, Campos WR, Oréfice F, de Moraes Figueiredo LT. Ocular manifestations in Dengue fever. Ocul Immunol Inflamm. 2004 Dec. 12(4):323-7. [Medline]. Gregory CJ, Santiago LM, Argüello DF, Hunsperger E, Tomashek KM. Clinical and laboratory features that differentiate dengue from other febrile illnesses in an endemic area--Puerto Rico, 2007-2008. Am J Trop Med Hyg. 2010 May. 82(5):922-9. [Medline]. [Full Text]. Eisen L, Moore CG. Aedes (Stegomyia) aegypti in the continental United States: a vector at the cool margin of its geographic range. J Med Entomol. 2013 May. 50(3):467-78. [Medline]. Waduge R, Malavige GN, Pradeepan M, Wijeyaratne CN, Fernando S, Seneviratne SL. Dengue infections during pregnancy: a case series from Sri Lanka and review of the literature. J Clin Virol. 2006 Sep. 37(1):27-33. [Medline]. Ismail NA, Kampan N, Mahdy ZA, Jamil MA, Razi ZR. Dengue in pregnancy. Southeast Asian J Trop Med Public Health. 2006 Jul. 37(4):681-3. [Medline]. Thomas EA, John M, Kanish B. Mucocutaneous manifestations of Dengue fever. Indian J Dermatol. 2010. 55(1):79-85. [Medline]. [Full Text]. Huang HW, Tseng HC, Lee CH, Chuang HY, Lin SH. Clinical significance of skin rash in dengue fever: A focus on discomfort, complications, and disease outcome. Asian Pac J Trop Med. 2016 Jul. 9 (7):713-8. [Medline]. [Full Text]. Radakovic-Fijan S, Graninger W, Müller C, Hönigsmann H, Tanew A. Dengue hemorrhagic fever in a British travel guide. J Am Acad Dermatol. 2002 Mar. 46(3):430-3. [Medline]. Liu Y, Liu J, Cheng G. Vaccines and immunization strategies for dengue prevention. Emerg Microbes Infect. 2016 Jul 20. 5 (7):e77. [Medline]. [Full Text]. Severson DW, Knudson DL, Soares MB, Loftus BJ. Aedes aegypti genomics. Insect Biochem Mol Biol. 2004 Jul. 34(7):715-21. [Medline]. Sim S, Hibberd ML. Genomic approaches for understanding dengue: insights from the virus, vector, and host. Genome Biol. 2016 Mar 2. 17:38. [Medline]. [Full Text]. Edelman R. Dengue vaccines approach the finish line. Clin Infect Dis. 2007 Jul 15. 45 Suppl 1:S56-60. [Medline]. Blaney JE Jr, Durbin AP, Murphy BR, Whitehead SS. Development of a live attenuated dengue virus vaccine using reverse genetics. Viral Immunol. 2006 Spring. 19(1):10-32. [Medline].